As a mom or dad, you know when you feed your child in a high chair most the food and up on the floor instead of in their mouth. TrayHaven creates a comfortable environment where nothing slips, flips, or falls onto the floor and away from your little one. With all items, secure, your child is happy and so are you. 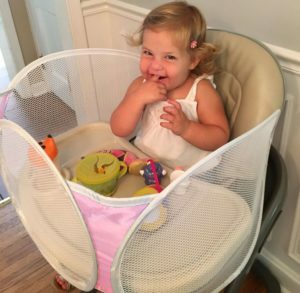 Thanks to the ingenious design that embraces your child’s tray rather on a high chair, stroller, booster seat, or wheelchair meals, snacks, and creative time has never been effortless. Clean and is easy as this snaps off and is easy to rinse, sink ready, and reusable. You can buy TrayHaven in either pink or blue for $34.99 plus tax. What this looks like is a highly adaptable wing-like barrier which can help make mealtime and outings less stressful for parents and young children. My Opinion: I really like the idea behind TrayHaven as instead of clean it up the floor in the highchair or table now you only must clean up where your baby your child eats is a doesn’t make it onto the floor anymore keeps it all in place and everyone is all smiles. 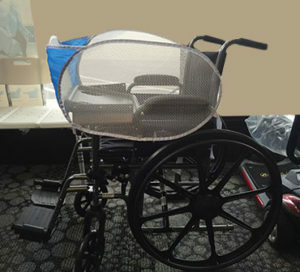 These are also great for those who are in a wheelchair or anyone with special needs. About Them: We've designed Tray Haven to work on most chairs with an attached tray: highchairs, booster seats, strollers, and wheelchairs. Jeff and I are the proud parents of two wonderful children who are now 21 and 14. We remember all too well those years of picking up after our little ones. Having a quiet meal, an uninterrupted conversation or even just an uninterrupted train of thought was nearly impossible. Every time we turned around, it seemed we were picking something up from the floor. Parenting our children has been our greatest joy. But, let's face it; some aspects of parenting are better than others. We hope TrayHaven makes every parent's life easier.